Spread over 14 million acres, Ohio’s 75,462 farms range from small hobby farms to large, family-run operations. All of them are equally important to the Buckeye State’s massive food and agriculture industry – the largest industry in the state – which contributes $105 billion annually to Ohio’s economy. Ohio’s farms are diverse in more than just size. Poultry, soybeans, corn, pork, dairy and sheep top the state’s commodity list in terms of production value, but you’ll also find blueberries, strawberries, sweet corn, honeybees, chestnuts, sunflowers and more. In fact, the state’s farmers grow and raise more than 200 products, which explains why Ohio is a leader in more than 35 product sectors. These farms differ in growing methods as well, from organic to conventional. In 2011, Ohio was home to 505 certified organic farms, a number that continues to grow with the rise in popularity of organics. more large farms (2,000 or more acres). However, most farms average about 185 acres in size, and the state takes the No. 7 spot in the nation in terms of number of farms. This agricultural variety is good news for consumers, who can take advantage of the wealth of local products available to them. Whether in grocery stores, at the farmers market or directly from the producer, consumers can easily find fresh, local foods. And while fresh fruits and vegetables are in high demand, the state is home to more than 1,000 food processing companies as well. Consumers can identify products grown or made in Ohio by the Ohio Proud label. The marketing program is part of the Ohio Department of Agriculture and focuses on promoting locally made and produced goods. Consumers who support local support global, too, as Ohio producers export agricultural products across the world, bringing even more to the state’s economy. According to the most recent data, the Buckeye State’s agricultural exports, including soybeans, corn and more, had a value of $4.4 billion in 2013. Ohio growers work tirelessly to produce some of the finest fruits and vegetables, meats, dairy products, snack foods, and more. Ohio Proud highlights these locally grown and made products, helping consumers easily identify local goods. The Ohio Proud label can be found on products in grocery stores, farmers markets and more, and acts as a familiar sight for consumers to know products were grown or made in Ohio. To qualify for membership, products must be at least 50 percent raised, grown or processed in the state. Ohio Proud helps producers as well. The program offers marketing opportunities including seminars and workshops, in-store promotions, networking opportunities, and more to help farmers and producers build their brand in the local community. Learn more about the program and find a full list of Ohio Proud partners at ohioproud.org. Thanks to a recent decision by Kraft Foods Group, the east-central city of Coshocton is sizzling – with the sound of delicious bacon, that is. In November 2014, Kraft Foods Group announced that all production and distribution for its Oscar Mayer bacon was moving to Coshocton. This included a $43 million-expansion of the town’s plant in construction, machinery and equipment costs. It also added about 300 jobs for Ohioans, doubling the previous workforce. of the town’s residents had to find work in nearby Columbus or Zanesville. Now, they can (literally) bring home the bacon. Buzzing bees might be a nuisance at your family picnic, but without these important pollinators, your basket would be one-third less full. Honeybees are essential for pollination of many fruits and vegetables grown in Ohio, including apples, melons, cucumbers, pumpkins and blueberries, as well as seed crops such as canola and sunflower. In fact, pollinators are responsible for one-third of all food grown in the U.S. The value of honeybees can be seen in the yields of certain crops in Ohio. For example, pickling cucumbers require 100 percent honeybee pollination. Strawberries need some bee pollination, but they can also self-pollinate. Without pollinators, the quality of the crop may suffer. Honeybees continue to play a vital role in Ohio agriculture. 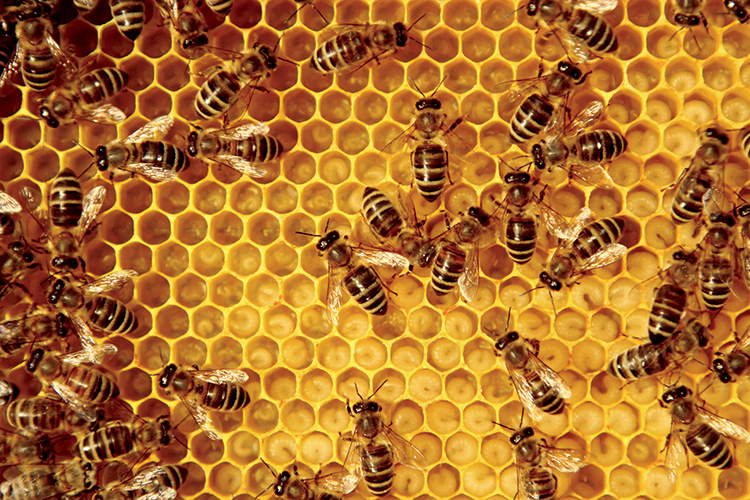 In 2014, the state was home to 4,435 registered beekeepers, with an estimated 39,055 colonies. Learn about the state’s leading agricultural commodities, based on cash receipts.